Finally, but no sign of the road car just yet. All aboard the hype train! After years of rumors, concepts, and spy shots, the name “Supra” is officially coming back. However, we will have to wait a bit more to see the road-going production model as for now Toyota is only willing to show us a conceptual race car, a lovely one at that. 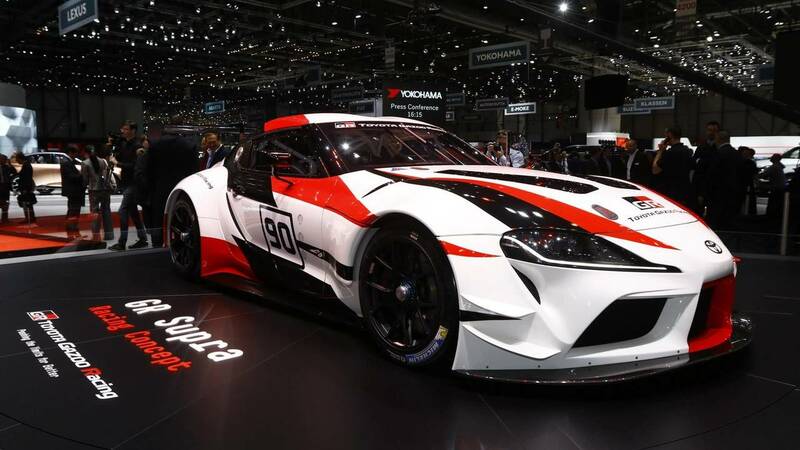 Known by its full name as the GR Supra Racing Concept, the showcar currently on display in Geneva takes the shape of a front-engined, rear-wheel-drive lightweight machine. Developed by the go-faster Toyota Gazoo Racing division, the concept signals the imminent return of the Supra after the illustrious name was retired back in 2002. As it was the case with the GR Super Sport concept revealed at the beginning of the year, technical details are rather scarce at this point. We do know emphasis was on using lightweight materials, hence why the windscreen and the side windows are made from plastic. Composite materials were used for both front and rear bumpers and diffusers, as well as for the hood, side mirror caps, and that big wing at the back keeping the car glued to the road. To shave off as much weight as possible, the door panels are made from carbon fiber and the cabin has been stripped down to the bare essentials. The GR Supra Racing Concept rides on center-lock BBS wheels and comes with the usual safety kit you’ll find in a race car, such as a full roll cage and fire extinguishers in case something goes wrong. We’ll be able to virtually drive the racy concept next month thanks to an upcoming update for the Gran Turismo video game. As for the highly anticipated road car, there’s no sign of it just yet, but the unveiling of a concept is a telltale sign the wait is almost over. Hopefully.